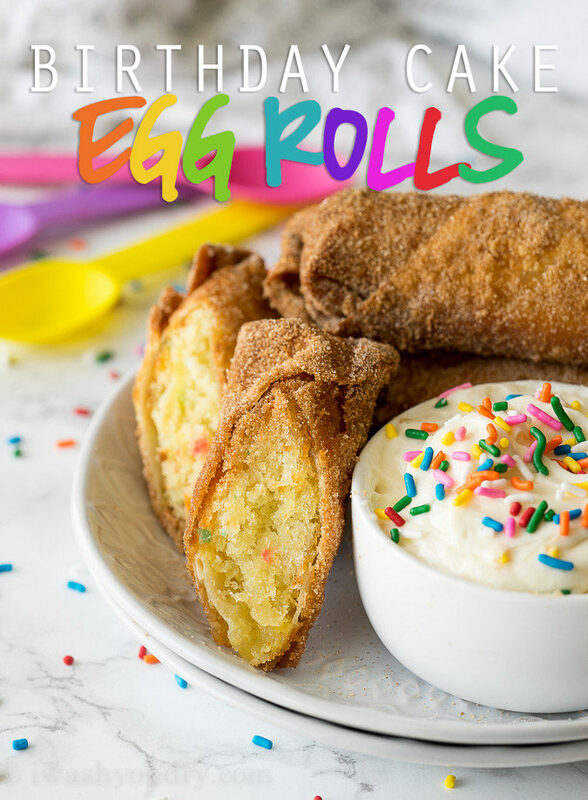 Birthday Cake Egg Rolls are a fun and out-of-this-world way to celebrate your birthday! 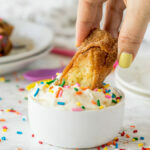 Birthday Cake Egg Rolls are like a giant cinnamon and sugar coated churro stuffed with a fluffy, funfetti cake inside. 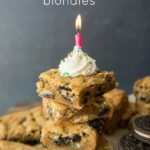 Dip them in the cream cheese icing or top with vanilla ice cream for the ultimate treat! I originally made these egg rolls back on April 5, 2013 for my birthday. I figured it was time to give them some fresh new photos and a fun video too. I’m seriously obsessed with these egg rolls you guys. They’re completely epic in every sense of the word. 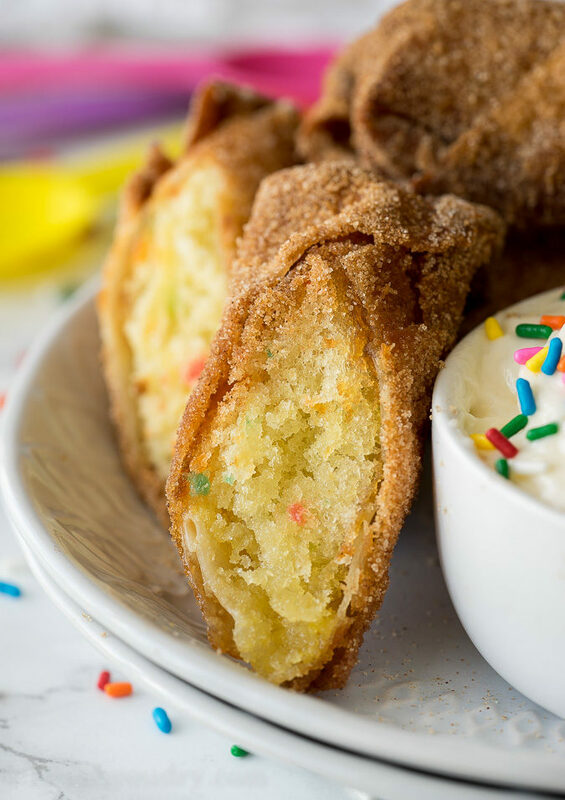 The truth is, these Birthday Cake Egg Rolls are freaking amazing. 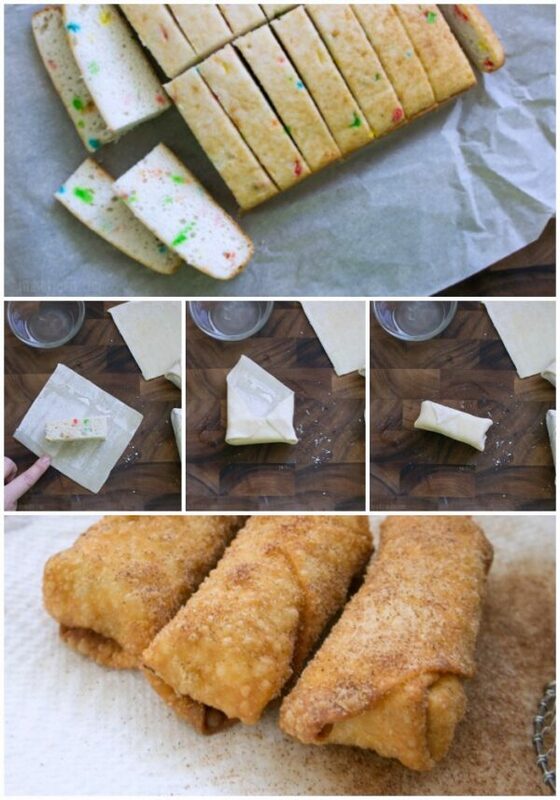 I took a fun-fetti cake, wrapped it up in an egg roll wrapper, then fried it till golden brown. Once it was done I rolled them in cinnamon and sugar. 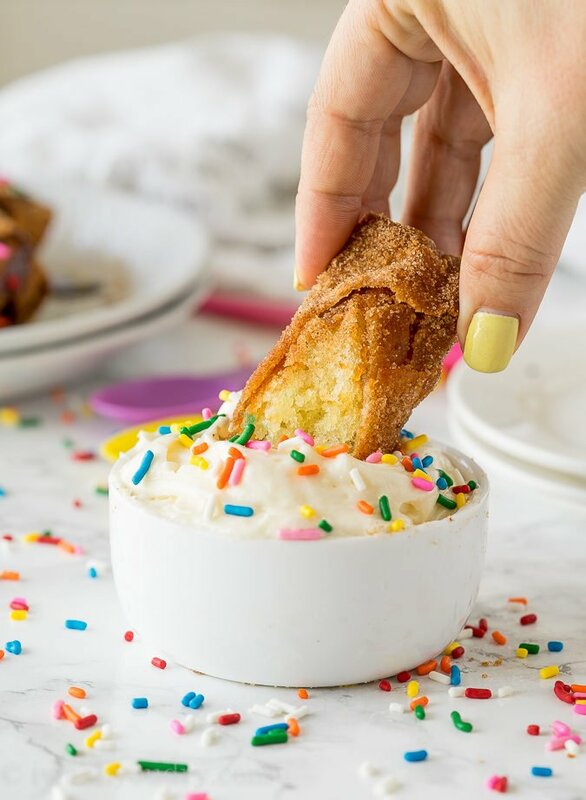 It tastes like a delicious cake batter doughnut wrapped in a crispy churro-like shell. 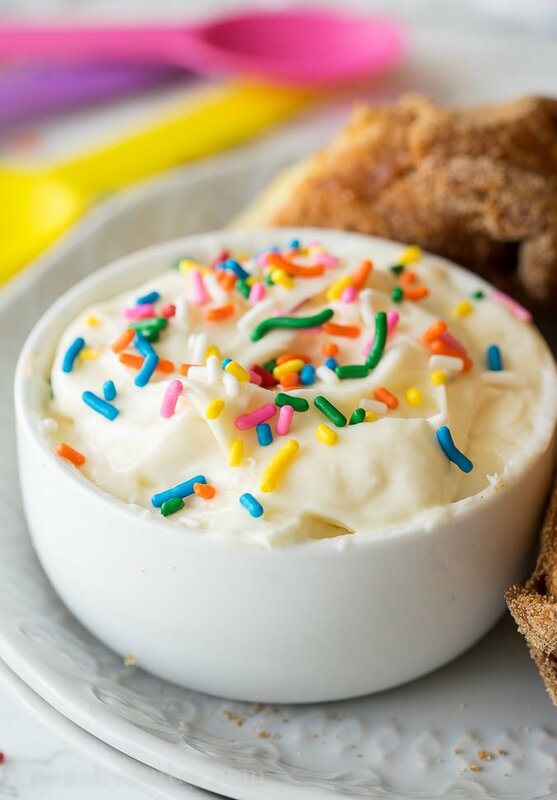 Don’t forget to make the buttery cream cheese frosting for dipping. After all, what’s a birthday cake without the frosting?! The outside egg roll wrapper becomes crisp, while the inside stays soft and tender, like a good cake should! 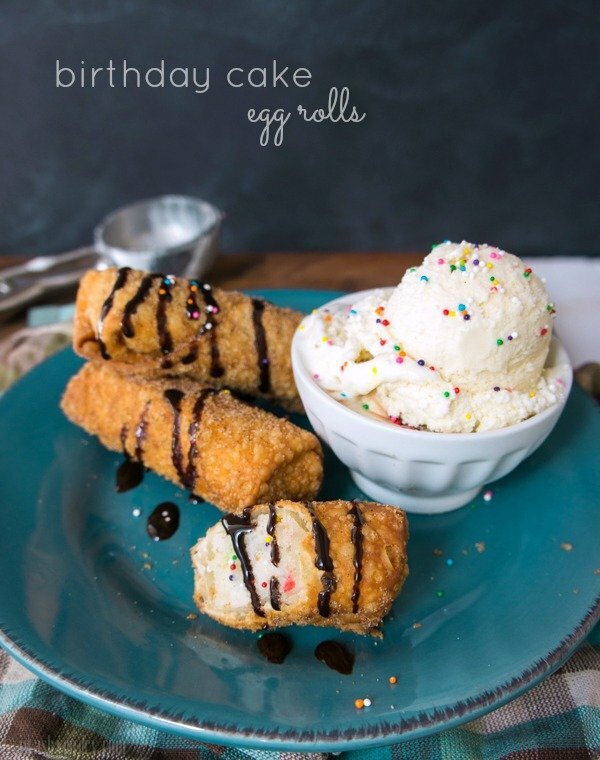 I mean, even if you’re not celebrating a birthday, these egg rolls should definitely find a place in your heart. They just bring a smile to my face every time I see them (and especially when I taste them). I feel like my work here is done. Now if you’ll excuse me, I’ve got another birthday party to start planning! 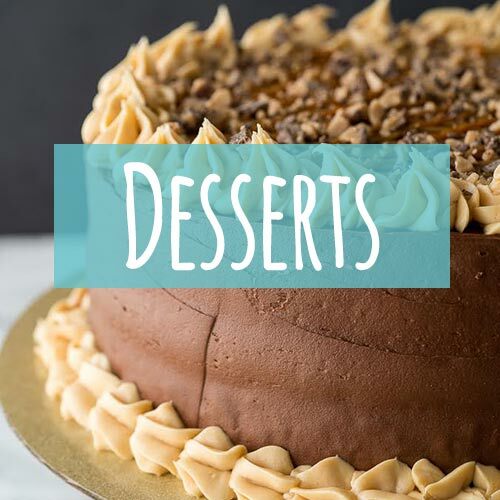 Prepare cake according to box directions in 2 8×8 square pans. Let cool to room temperature, then cut the cake in half, then cut the two halves into 1 inch slices to make little rectangles. Heat 3 inches of oil to 375 degrees F.
Place a rectangle of cake in the center of the egg roll wrapper. Dab your finger in the egg and run it along the edges of the egg roll wrapper. 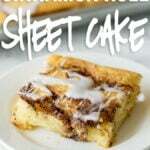 Fold the bottom corner of the wrapper up and over the cake, then fold in the right and left sides. Roll the egg roll away from you to seal it up. Repeat with the remaining cake rectangles. Fry in the hot oil for 2-3 minutes or until golden brown. Meanwhile combine the cinnamon and sugar in a small bowl. Remove the egg roll from the oil and place on a paper towel lined plate. 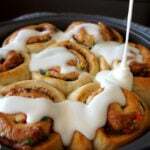 While still hot, roll it in the cinnamon and sugar mixture. Beat the butter and cream cheese together in a medium size bowl until combined and fluffy. Add the vanilla extract and heavy cream and beat until smooth. Gradually add the powdered sugar and blend until light and fluffy. Add more sugar if desired for extra sweetness. 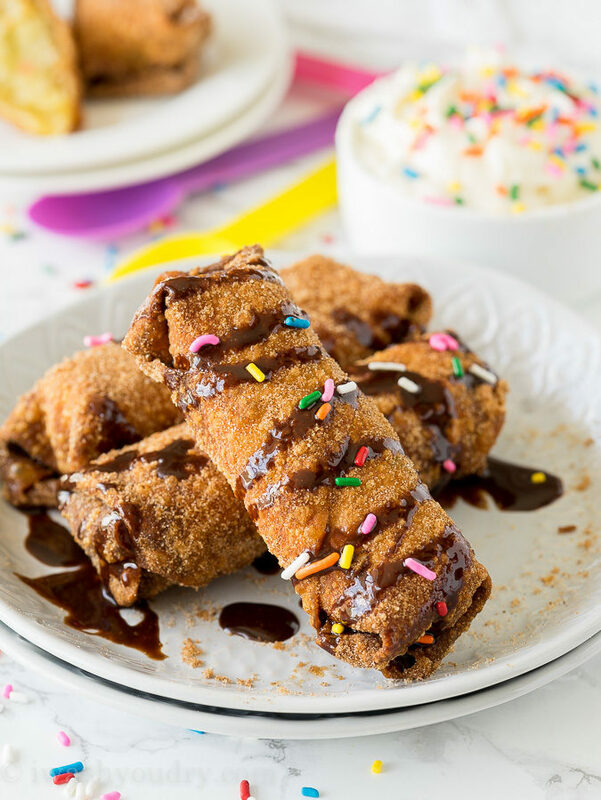 Drizzle the egg rolls with chocolate sauce and sprinkles if desired, or serve by dipping in the frosting. Enjoy! If you don’t want to prepare all the egg rolls at once, you can freeze the left over cake and save it for another day. Original recipe created 4/5/2013 by Shawn. Update on 5/10/2017 by Shawn. 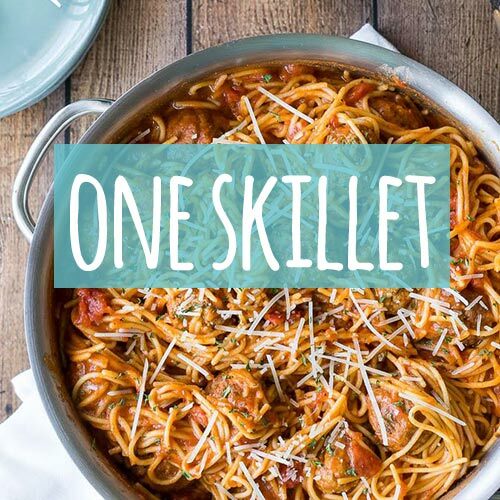 This sounds so crazy…and delicious! Ha! I love cake batter! !